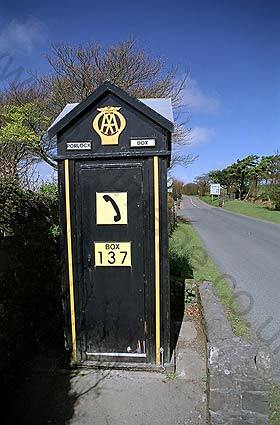 During the early and mid 20th century, the British Automobile Association built more than 1,000 private emergency roadside telephone booths for the use of its members. The remaining structures are now preserved as examples of historic architecture. 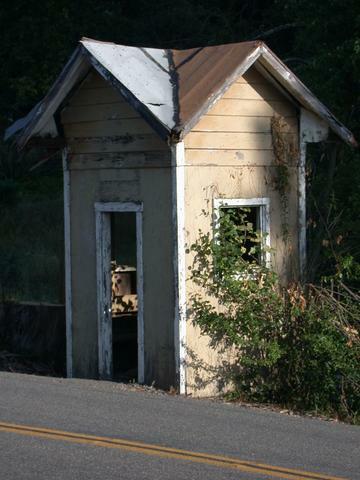 The Burgess Bus Stop, originally located on Laughlin Road near Forestville, in Sonoma County, California, USA, is strikingly similar in design to these AA Telephone Booths -- and resembles no other building i have ever seen in the United States. 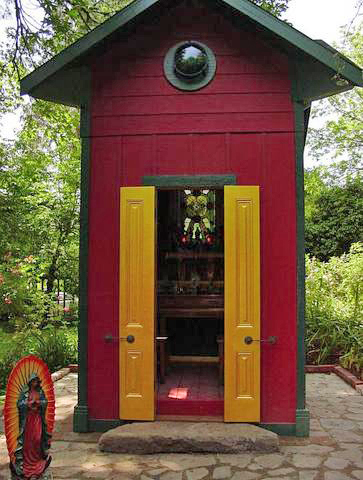 Don Burgess -- who created the private bus stop in the early 1960s as a shelter for his daughter to wait for the school bus to pick her up -- was a commercial artist and a skilled hobby carpenter. Did he get the idea for his unusual cross-gable structure from having seen Automobile Association roadside booths in England? We do not know for sure, but we do know that he served in Europe during World War Two, and he did spend time in England -- so here, for the sake of comparison, are some photographs. 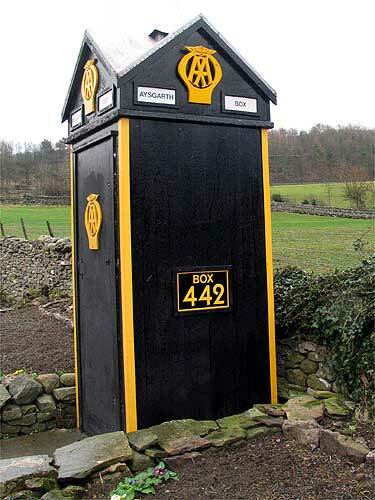 Each British Automobile Association Roadside Emergency Telephone Booth was numbered, so that stranded motorists could tell the AA where they were located. 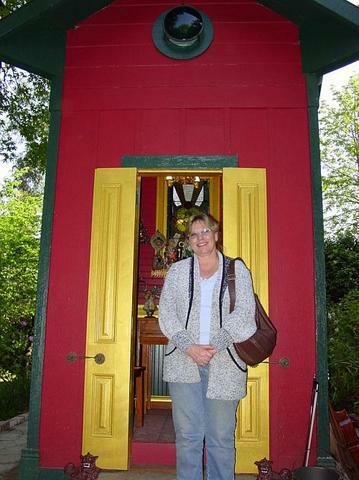 Box designs and proportions varied quite a bit over the years, as each booth was hand-made by local carpenters. However, all of the AA booths featured cross-gable roofs, vertical trim boards, and a prominent fascia. Here are Box 137 and Box 442, and next to them, for comparison, the Burgess Bus Stop, its southwest roof corner heavily damaged after a Eucalyptus tree was accidentally felled on it. 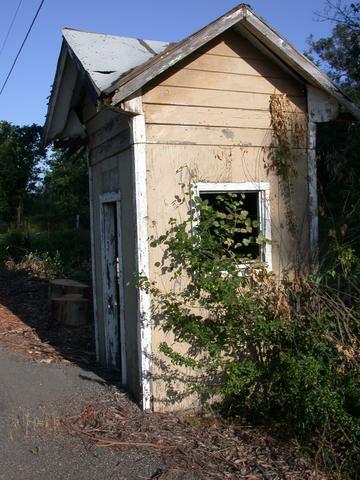 Here is another view of Automobile Association Box 442, with the Burgess Bus Stop shown from approximately the same angle. 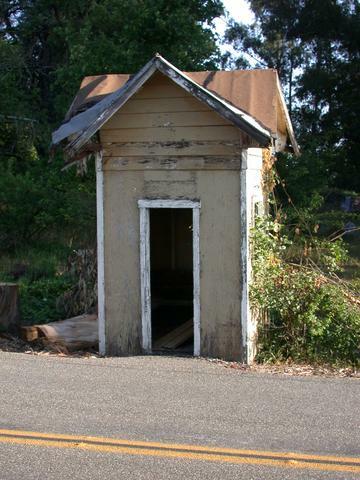 One visible difference between the two is the deeper overhang of the Burgess Bus Stop roof, a feature that derives from the local Victorian Vernacular farmhouse roof style popular in rural Northern California. 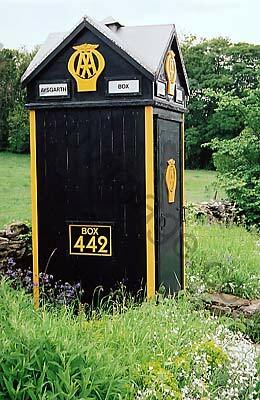 The depth of overhang varied greatly on AA phone boxes, however, as can be seen below. 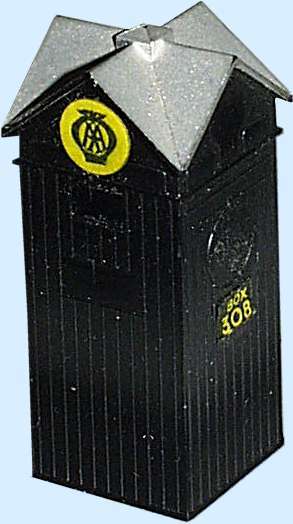 Here we see Automobile Association Roadside Emergency Telephone Box 321, the Burgess Bus Stop, and a model train layout replica of Automobile Association Box 308, showing the complexly folded look of the cross-gable roof. 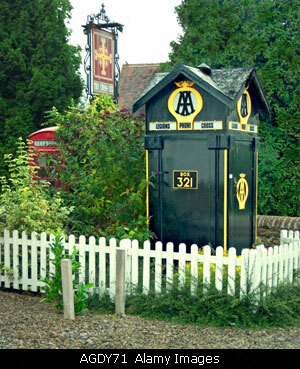 Box 321 has a deeper gable overhang, making it the most similar of the surviving AA Emergency Boxes to the Burgess Bus Stop. These photos also point out a minor difference between the British phone booths and the American private bus stop: the British buildings feature a small vent-cap at the roof apex, while the bus stop was unvented.